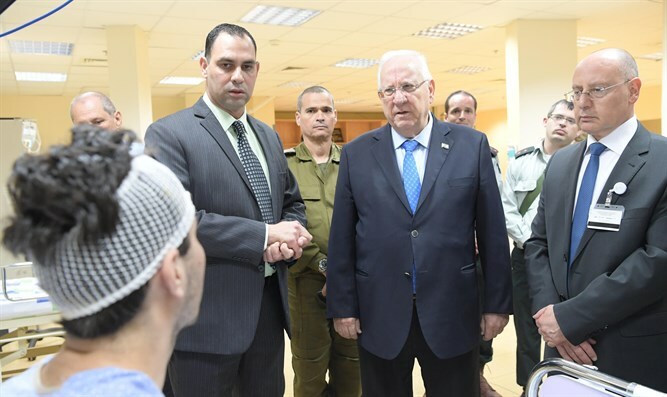 After meeting with IDF soldiers on Sunday, Israeli President Reuven Rivlin visited the Western Galilee Medical Center in Nahariya, and met with the medical staff. Also present at the meeting were Health Ministry Director General Moshe Bar Siman Tov, and Galilee Medical Center General Director, Dr. Masad Barhoum. Since March 2013, more than 1,500 of those wounded in the civil war in Syria have reached the Galilee Medical Center in Nahariya; about a third of them children and infants. During his visit to the hospital, the President met with hospital staff and spoke about the unique nature of the hospital, which serves the entire region. “Your business is pride,” the President told the medical staff, and continued, “Israeli pride, Jewish pride. It is proof that the world is built on kindness. Israel will continue to do everything it can with responsibility and wisdom, in order to alleviate the suffering of the people who experience daily slaughter here on the other side of the border." During his visit, Rivlin spoke with some of the Syrian victims, and (through an interpreter) heard of the humanitarian assistance that the State of Israel had been providing in recent years with cooperation between the IDF and the hospital staff. Dr. Masad Barhoum spoke of his recent address at the AIPAC conference in the US. “It was an opportunity for me to present the story to fourteen thousand people, and a few million others who were watching the various channels of communication,” Barhoum said. “To explain how we turned those wounded Syrians from enemies to friends. “The treatment of the wounded Syrians has turned our trauma center into one of the most experienced in Israel, and one of the world leaders in providing care for complex and difficult war casualties, which is a matter of great pride. But it is inconceivable that the Galilee Medical Center bear the burden of the cost of a national project, of a government decision.